Stay at SEE FOREVER and see how it got it's name. Relax on the decks or in the cabin and you'll enjoy the magnificent views of the mountains from every room. 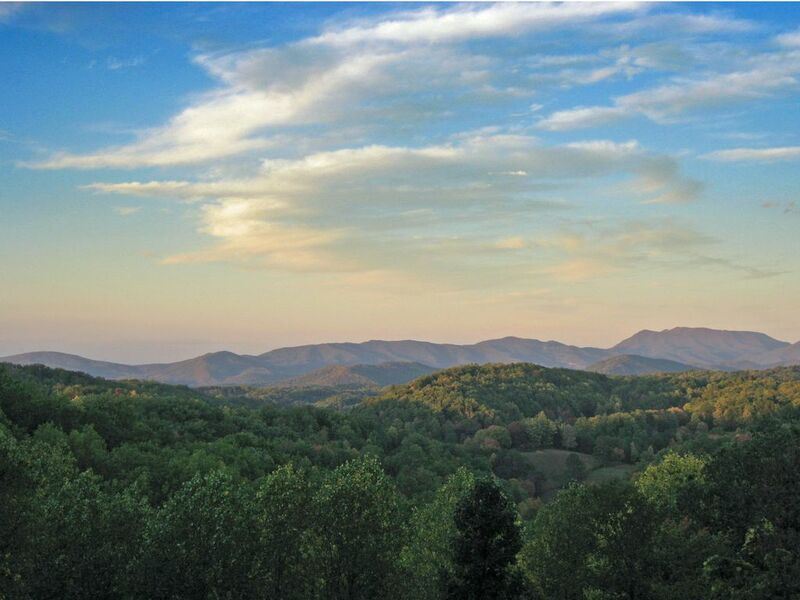 Convenient to the Great Smoky Mountains National Park where you'll find beautiful hikes with big views, waterfalls and of course the local attractions are nearby. Please contact owner for alternate payment methods. A spectacular cabin nestled in the Smoky Mountains with three decks for scenic viewing. When you stay at SEE FOREVER you will appreciate the amenities AND you're only minutes away from downtown Gatlinburg, Pigeon Forge, Dollywood, Splash Mountain, golf, outlet shopping and everything this scenic area has to offer, yet you'll feel nestled away in this cabin in the woods. You'll feel like you're a million miles away! Smoky Mountain National Park is a short drive and there you will witness some of the most breathtaking hikes and beautiful drives you have ever experienced. See wildlife, wildflowers and culturally historic areas, buy some of the best blueberry jam you have ever had and get a taste of what life may have been like in years past. There's plenty of room for friends and family to enjoy time together or apart. Try a game of pool, watch a move or enjoy the large hot tub on the deck. Meals are a pleasure to prepare in this open, fully equipped kitchen where the cook will always have a view. Relax in the hand crafted log chairs on any of the three decks or enjoy the hot tub and let the aches from a long hike fade away all while enjoying the breathtaking view of the Great Smoky Mountains. Located near the Arts and Crafts Community where you'll enjoy hours checking out the arts and crafts of the region and some fine apple pie. SEE FOREVER is perfect for your family and friends and when staying here it'll feel like home! This will be your best vacation ever! Stay at See Forever and create wonderful memories. Eat in family style dining with fully equipped kitchen to meet all your needs. Mountain views from walls of glass. Bar-B-Q grill just outside the front door. Tall windows surround the main level for sunny exposure and a magnificent view. Two leather sofas, TV with DVD and gas fireplace. Glass door opens to main deck with hot tub and chairs. Handcrafted staircase leads to upper bedroom and loft and downstairs to bedroom and entertainment room. Original hand crafted log furniture, deck with Jacuzzi and log chairs. Master bath with whirlpool tub and separate shower. TV. Located on the main level. Original hand crafted log furniture, private balcony for taking in the the gorgeous view. Bath has tub and shower. TV with DVD player. With sofa, chair and stereo system - the perfect place to lounge, exercise or read a book while looking out the large windows and taking in the view. Original hand crafted log furniture, large deck with beautiful mountain views. Bath has tub and shower. TV. Features big screen TV with DVD, music system with 5 CD changer, and surround sound, Pool table and movie library. Sleeper sofa, comfy chair and two end tables. Laundry closet with washer and dryer, iron and ironing board. Large covered deck with log furniture. Outdoor grill for bar-b-ques, lighted driveway, wrap around porches, feel of privacy and seclusion. Enjoy! For those looking for a swimming pool consider The Gatlinburg Community Center! The Community Center is nearby and offers bowling, swimming, basketball, billiards, racquetball and a walking track, all for only a couple of dollars a day! Located a little over 3 miles from the cabin. The Gatlinburg Golf Course is is nearby for those of you who love to golf, nearby Arts and Craft community provides great shopping for local crafts and the cabin is centrally located between the Greenbrier and Sugarlands entrances to the Great Smoky Mountains National Park. If you are looking for a private location with the feel of seclusion yet close to all the activities this is the cabin for you. If you want to walk to the Gatlinburg strip this won't be your cabin of choice, but consider the beauty of the mountain views and relaxing with family and friends away from the lights and action of downtown. The Smoky Mountains offers so many of the things I love to do; hike, bird watch, looking for flowers and waterfalls. Living at the beach, while very beautiful, I do appreciate the change of scenery and being among the giant trees and seeing the beautiful mountain vistas. I work very hard and am always excited to head to my mountain home and relax a bit. (as an Amelia Island Realtor I am never really 'off-duty'). I enjoy bringing friends or family with me to hike the trails and share a meal on the porch and take in the view from the cabin. I was a very picky purchaser and I am sure I drove my Realtor crazy looking at everything that came close to meeting my specific needs. I had to have a fantastic view with a feeling of privacy and a comfortable, newer cabin with 2 living areas. When this one came on the market I made a quick 8 hr drive up to see it and then back the next day. I called to make the offer and someone else had beat me to it. Amazingly their deal fell through and I was able to step in an purchase the cabin. I chose this cabin because it has AMAZING views, is private yet close to the Park (centrally located between the Greenbrier entrance and the Main, Sugarlands entrance) and was much nicer than so many I looked at. I love the 3 decks and having the main living room plus the downstairs family room with the game table and TV entertainment. We always have a great time! Waking up in the morning and looking outside first thing is when the view is especially gorgeous and makes me smile and feel happy to be alive. It is close to shopping the Arts and Crafts community as well as the grocery store and good restaurants off the beaten path. I love NOTseeing other cabins around me, but knowing they are nearby if needed. I appreciate the option of some of us being upstairs enjoying conversation and others downstairs watching a movie or playing a game. Tub and shower in two of the baths and a whirlpool tub and separate shower in the master. Gorgeous long range mountain views. The morning views are especially beautiful! Laundry room with washer and dryer and detergent. Ironing board and iron as well! Includes dishwasher, and most small appliances including blender, crock pot, coffeemaker, ice cream maker. (3) Main level offers hot tub and hand crafted log furniture and two additional decks offer hand crafted log furniture to enjoy the view. Wrap around deck, private top level balcony and lower level deck. Wow, I wish I had known that as I could have sent the cleaner back. The cleaner always leaves soap, laundry detergent. No shampoo is provided. For the fireplace you just turn the dial at the top left on the stone facing. New pool sticks were added about a month ago so I am shocked the tips were off already. I'm not sure what's up with the toilet seat, but I will sure have that resolved. The TV should work fine so I am in the dark about that, but I wish you had called so I could have made your stay better and had those items taken care of, but I am so sorry it was like that in the first place. The cabin was great! Had a great layout and plenty of room! I am a foster parent and was placed with a group of three shortly before we left and had enough room to share it with them! The view was gorgeous from sunrise to sunset! Had everything we needed and more! I am so glad it worked out for you all and what a great way to welcome your foster kids! Very nice, very clean, and great floor plan! This cabins was perfect for three couples with a bedroom and bathroom on every floor. The location was perfect. Very secluded but only a 10-15 minute drive to everything we wanted to do! And the view was great!The TV's weren't the best and we could only get 1 channel to work on each one. Maybe there was just a trick to it that we weren't able to figure out but this wouldn't keep up from booking again! Overall we had a great experience and would not hesitate to stay here again! I'm so glad you enjoyed the cabin and had a great visit! I am sorry about the channels and I'm not sure what would cause that. I would have been happy to call Comcast as that is certainly unusual. I'll call them now. Thank you! We decided to start the new year off by visiting Gatlinburg. Pam's cabin was a great choice as the place of stay for our trip. 15 minutes to Downtown and 20 min. to Pigeon Forge. The roads leading up to cabin are secure and easy to navigate. The cabin itself felt very warm and homelike. The beds were comfy and the kitchen had everything we needed. Coffee in the morning on the porch was great and the view made it even better. Pam was great and very communicative the entire trip. We made some memories here. Thank you! How wonderful! Making memories is what it is all about. I am thrilled you had a good visit and found everything to your liking. Absolutely loved our destination Thanksgiving with family at the See Firever cabin. It was super clean with great amenities. The view from all three decks was absolutely stunning! The kitchen was well stocked & met all our needs to prepare our Thanksgiving meal. Fireplace was phenomenal! The main floor was the hub for all our gatherings and surprisingly very little noise traveled downstairs if you wanted a quiet place to hang out. The hot tub was a great way to unwind after a long day. Our MB mattress was comfortable; firm as all the others in the cabin. Bathrooms were well stocked; just sad the hot water heater could not support the use of the Jacuzzi tub in the master bath. I knew from previous reviews the TV’s were old & small. Definitely made it more challenging to watch Thanksgiving Day football games. Updating the TV’s would be a HUGE improvement. The size of the one in the main living area could be increased without compromising the view. Another suggestion would be to replace the mattress on the downstairs pullout sofa. The location is close to everything while providing the feeling of privacy. We loved our stay! Great amenities without the huge costs of other cabin rentals. I am so pleased you enjoyed the cabin and the view. Your comments are being addressed as we speak! I will also check on the hot water for the Jacuzzi as the water heater should be able to handle that without issue. It fit our needs for 3 family’s and 1 baby perfectly! Beautiful view, nice and quiet! View is awesome, cabin is located in nice quiet area. Love that each of our family’s had their own bed and bath. We had 2 nice areas to all sit and visit together. Price was reasonable. No complaints. Pam was super nice and so easy to work with. We would love to use See Forever again! Pigeon Forge with Dollywood, Splash Mountain and all the attractions for the family, Smoky Mountain National Park with exceptional hiking and beautiful drives, Arts and Crafts Community where you can look for days at various shops featuring locally made arts and crafts. Festivals, arts, music events. Arrowmont Arts and Crafts school. Wildflower and photography walks. Maximum number of guests is 8. No pets allowed and No smoking. Children welcome, but there is no yard to play in. Most people enjoy the activities of Gatlinburg, Pigeon Forge and Great Smoky Mountains National Park as well as relaxing on the porch, enjoying the view, or playing in the game room.